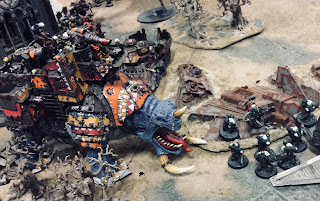 A blog of mostly Warhammer 40,000 stuff, mostly for my own amusement. Da Kodex iz out ladz! WAAAGH! So I got my claws on it. I like it. 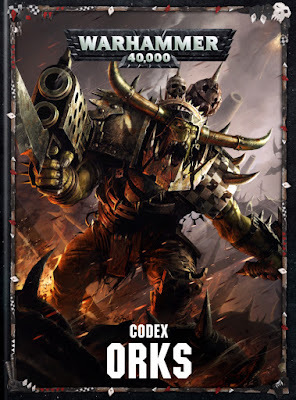 There is lots of information out there already on the Codex, so I'm not going to do a full rundown or anything, but I thought I'd post my initial impressions and some thoughts on a few of the things the internet has been talking about. So firstly. Is it a good book? Yes, I think so. Is it hyper competitive? Probably not, but it certainly looks strong enough for me to bash some heads. Does it have everything I wanted in it? Erm... no. Obviously the addition of Stratagems, Kulturs, Warlord traits etc instantly makes this a lot more interesting than the index, and points drops across most of the overpriced units was very appreciated, but there are definitely a few things that were not quite right for me. 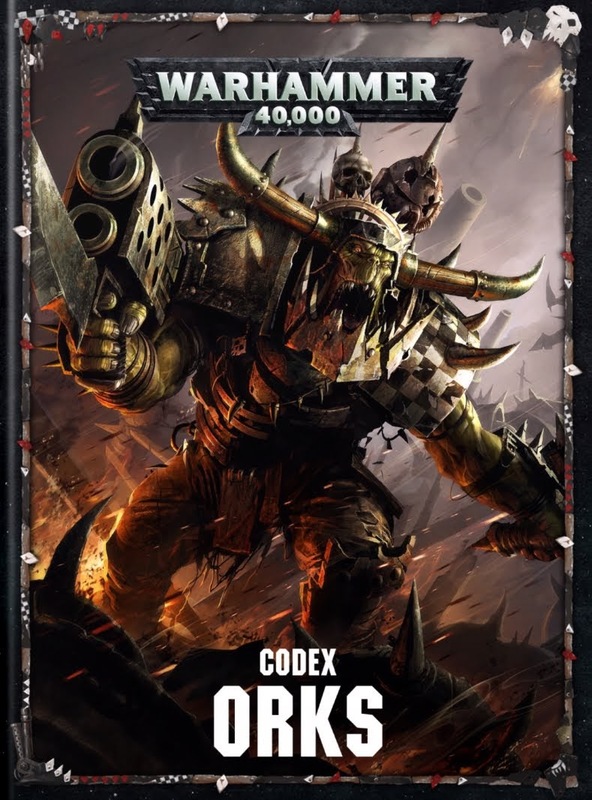 Things like Painboyz not interacting in with the Snakebite kultur, and the Goff warlord trait being a strictly worse version of a generic one are slight grievances. More notable is the still massively overcosted Stompa, and the relegation of many options to the index. I'm generally ok with index options as a means of allowing use of out of production minis and I don't believe they are going to be invalidated by GW anytime soon, but the fact is it is an inconvenience, and as tournaments start banning index options it might eventually be seen as a 'that guy' thing in friendly games. Snakebite Battalion and Supreme Command, 9 command points, 1995 points. Warboss, Powerklaw, Combi-shoota/skorcha, Attack squig, Brutal but Kunnin', Da Killa Klaw. Big Mek [index option], Kustom force field, Powerklaw. 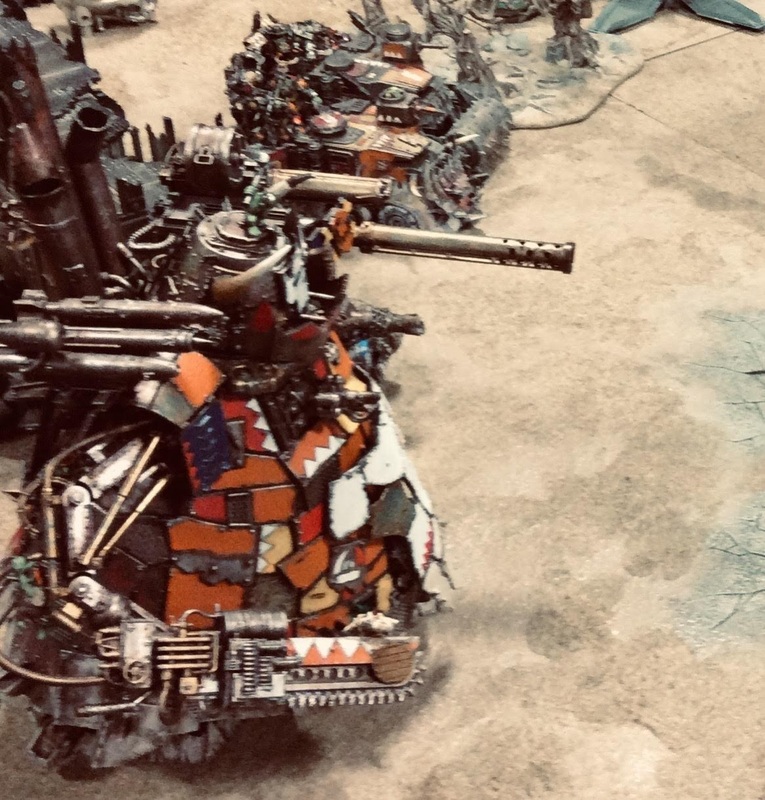 Big Mek [index option], Kustom force field, Combi-shoota/skorcha. 25 Boyz, Powerklaw, 2 rokkit launchas. 20 Boyz, Shootas, Powerklaw, 2 rokkit launchas. 17 Boyz, Shootas, Powerklaw, Big shoota. Nipper the Gargantuan Squiggoth [Forgeworld], Killkannon, Big-zappa. So, the plan is, 17 Boyz, the Boss, the Banner Nob and a Mek pile onto the Squiggoth, while the other Mek and the Burnas get in the Gorkanaut. Everything goes forward. Hopefully with two big scary targets one of them should reach the enemy along with a wave of Boyz. Krumpin' happens. Da Boyz win! Easy. 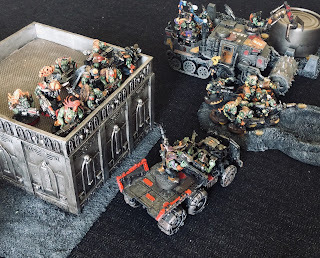 Thanks to a recent forgeworld FAQ Nipper should get the benefit of the force field when the Mek is embarked, and as part of the Supreme Command detachment will get the Snakebite Kultur, which might keep him around a bit longer. It's also worth noting that as a Snakebite model, he will benefit from the effects of the WAAAGH! banner, which should make him significantly stompier! A Gargantuan Squiggoth is one of those models I have always wanted but never quite been able to justify the cost. The fight again strat should be pretty handy though and the 5++/6+++ will definitely help it. Who is this Redtoof and what does he want? Hello, my name is Dan, and I do nerd stuff. I go by Redtoof in various corners of the internet, including Twitter, after my Ork Warboss. I build, paint and play 40k things, including Orks, Tyranids, Chaos Marines and Adeptus Mechanicus. I also play a lot of D&D and have been getting into Blood Bowl. I made a blog to keep a record of my battles and what I've been painting, and it's cool if anyone else likes that, but I'm happy enough if I have less followers than fingers.